In 1999, Malaysia transfered its seat of government from its capital city, Kuala Lumpur to Putrajaya, a planned city that currently holds a number of federal administrative buildings of Malaysia. Putrajaya was built from scratch and was transformed into a mammoth city it is today. 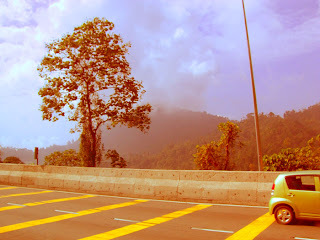 It has since become one of the three Federal Territories of Malaysia along with Kuala Lumpur and Labuan. From Kuala Lumpur we went to Genting Highland, a place on top of a mountain that was developed starting in the 1970's by one of the richest man in Malaysia. Fast forward to today, it is the site of the First World Hotel, renowned for being the second largest hotel in the world, a casino, a theme park, a mall and a nearby residential village. To go there you need to take a bus from KL Central Station, you can either go there by car or a bus that will have a stop at a place that will offer visitors to ride on a cable car. 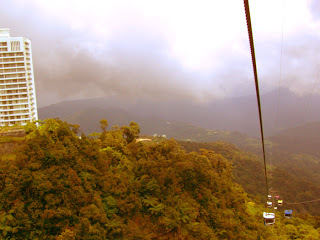 Riding the cable car seems more exciting as it gives you a wonderful view of the surrounding mountains. 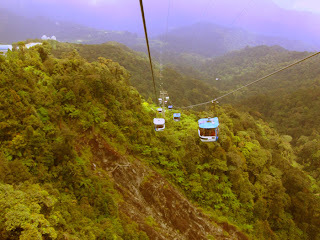 It is said to be the longest cable car in Asia and about a kilometer long if my distance estimate is correct. 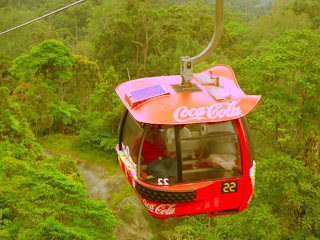 It was also my first time to ride the cable car. 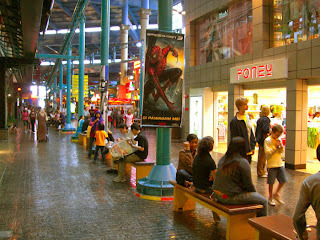 The highlight of the place was the location of course, the weather is cool, just a bit less colder than in Baguio (we went there during summertime in the month of May), the theme park which has an attraction called "Genting Sky Venture" a free fall simulator, a casino, a waterplash pool, a big mall among others. It's a place that will be much appreciated by travelers coming with their own family, the kids will surely enjoy the place more than ordinary backpackers who prefers the beaches more than the comforts of hotels and themed attractions. 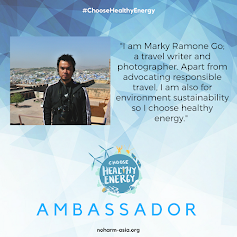 This trip was my very first trip out of the Philippines. Sending my gratitude to budget airlines such as Air Asia, blokes like me can now easily afford to travel in the South East Asian region and Kuala Lumpur presented the opportunity itself for me to experience out-of-the-country travel. I traveled with my older brother who I shared a zest for traveling. We booked Kuala Lumpur Hotels on Traveloka two months advance and also fixed our itinerary by researching on the Internet. We ended up choosing Swiss Garden Hotel which is located right in the heart of Chinatown in Kuala Lumpur (Petaling Street). For about 5 thousand pesos, we managed to book a twin sharing room for 3 nights, making it a really great deal (also includes breakfast buffet for two). We arrived at Kuala Lumpur airport (which is about an hour drive from the city) in the afternoon, upon arriving at the hotel we were greeted by a friendly hotel staff who processed our reservation. After resting for a while, we then explored the city afterward. First things first as we were already starving, we stopped by to eat at this Chinese hawker stall by the sidewalk. We ordered some Chinese dishes and yang chow fried rice, all in all it costed us 50 Malaysian Ringgit (about 7oo pesos ouch). We took their LRT and went to our first stop on our short itinerary, the Petronas twin towers. Going there during nighttime seems like a good idea as the lights and the skies put more emphasis on the towering Petronas dominated skyline of Kuala Lumpur. 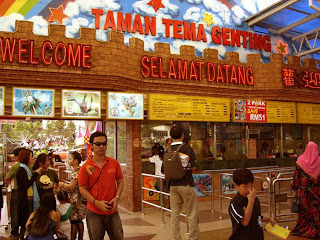 Next day, we started walking around Kuala Lumpur right after we got done with our breakfast. Places like Masjid Jamek, Dataran Merdeka, National Museum, Little India, Sri Mahamariamman Temple, KL Tower and then some are just some of the places we visited. On the viewing deck of the KL tower, one will see a bird’s eye view of the whole city including a close up of the nearby Petronas Towers. It was fun just walking around a new city, Kuala Lumpur seems much cleaner than most cities, I read somewhere – and It shows, there seems to be a sense of order in the way commuter busses and other motorists use their roads, pedestrians can walk better along a spacious sidewalks with nary a single sidewalk vendor. Along the way you’ll meet people of different races as Malaysian population consist of the Malay race, Chinese and Indian nationals, probably because in the early part of their history both Malaysia and India along with Singapore are all under British rule, thus the interchanges of their own people on this three countries. On our way to Pagudpud, Ilocos Norte we stopped over at Vigan, Ilocos Sur to attend a mas (fyi: I got to mass once in every 5 years), eat some empanada and of course visit the heritage village at Calle Crisologo which is included in the list of the United Nation’s World Heritage Sites. Walking along Calle Crisologo – seeing those antique shops and old houses that dates back to Spanish colonial era kind of gives you a slight picture of how life was lived back in the old days. Around the area you’ll see the Ilocos Sur capitol hall and the nearby park. 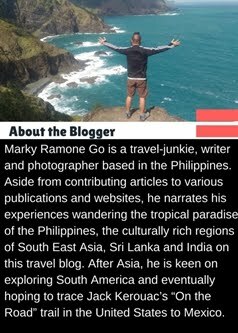 Vigan is a great place to visit on the way further North of Luzon, either by pit stop or the main point of your destination. There’s a nice inn near Calle Crisologo where visitors can stay. What a way to have a fine food trip (Empanada, but many says Batac’s Empanada is the best of em all) go down a historic tour of the old colonial houses at the heritage village in Calle Crisologo or stroll around town riding one of those horse carriages parked besides the church. One of my favorite places so far is Quiapo, located in the heart of Manila its the place where people converge with each other. The religious ones, students, leftist militants , hookers, junkies and the occasional thieves which scares those whom have never been to this place before. Generally a safe haven for blokes like me. I feel more secured rummaging around this place than lets say Greenbelt in Makati. I’ve scored over two hundred pirated DVD’s in this place. Sue me for buying pirated stuffs. I remember during my college days me and my friend Jacob would skip school and instead spend our day just walking around Quiapo, sometimes we would buy hard to find cd’s by bands like Pennywise, Sham 69 and Bad Brains. Jacob got all of his original Clash cd’s from this place. At that time it is priced at 250.00 each, cheaper compared to the 450.00 price that record shops at the malls are charging. 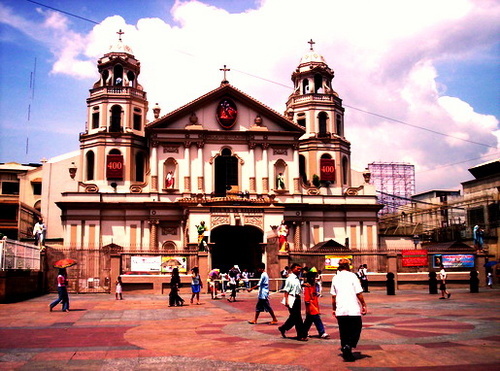 I am still looking for a girl who would go out on a date with me and go strolling in Quiapo mindlessly. 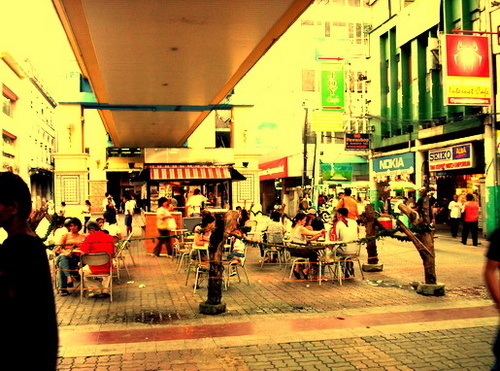 Used to be the center of economics in both the post war and pre war Manila. 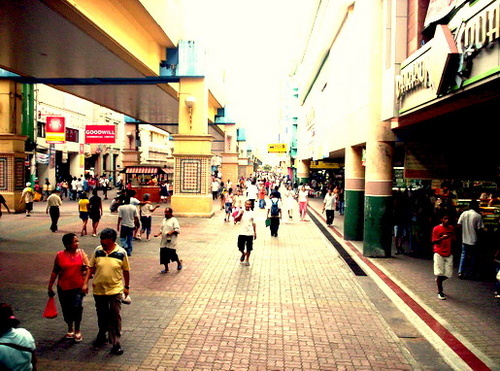 It was said that SM founder Henry Sy started selling shoes at this historical avenue. But that was the so called “Kopong-kopong Days”. Today Avenida was somehow rescued from total oblivion during the late 90’s when as a UST student myself I have witnessed the erosion of the place, it’s like a total ghost town back then. Mayor Lito Atienze somehow brought back some color to it, albeit some architectural design flaws, it can be improved much better. Still and more importantly it had renewed vigor and the place are now livelier than before. It’s not Disneyland or some European walkway where you can sip coffee and talk to your girl like Ethan Hawke and Julie Delphy. Avenida has its charms totally different from the others. I can say it borders from exotic, to chaotic to serene. I take long walks here sometimes just in order to get my mind back. Of course I do it with one eye around me. Thieves are everywhere and they do exist in Avenida also. It’s much safer than ordinary Filipinos would think. 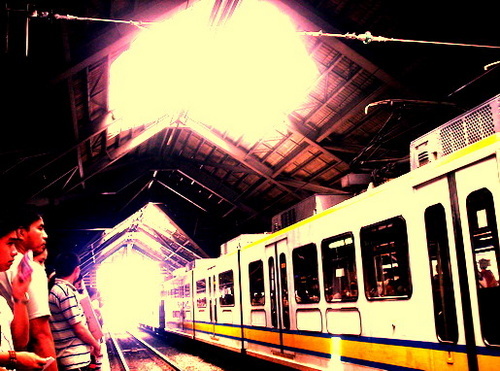 I know that mindset of thinking about crowded places being a hum drum of criminality. Where else can you find a more exotic locales in the city, where they sell cheap ipods, a blind Bob Dylan guitarist belting out classic Pinoy blues, a pub house and all that comes with it hehehe. Well I think I had to wait up for those changes or forget about it as I had myself to change first…. Went walking around Makati City, the business hub of the Philippines as they say – one Sunday afternoon after I got done with my work shift. It feels a bit eerie like you’re in some zombie – end of the world movie, comparing Makati during weekdays to a Sunday is like day and night. There are too few people on the streets, with almost all establishments closed down, a few cab drivers trying in vain to pick up passengers, security guards and a few wanderers like me were the only walking and moving figures I encountered. The towering buildings seems like ghosts bearing shadows upon us. Rush hour in Makati during weekdays was like “every man for himself” with regards to riding a bus or flagging a cab, Oh no not this day though. The pay phone booths are lined up and are all “pretty vacant”. You can call whoever you like, politicians, enemies of yours or some random person and shout the hell you want and nobody will bother you. Do we just had a zombie virus outbreak that I missed knowing about? Anyway I’m out of here. On the other hand, a jumper might not create too much traffic jam this Sunday afternoon.